Numerous national events and tours, not to mention hundreds of individual fundraising events, were organised in 2017. The eighth Women’s Bank Walk gathered a record number of volunteers to show their support for female employment on Sunday 10 September. The Walk was organised in 70 cities, 19 of which were abroad. The northernmost event was organised in Rovaniemi, Lapland, and the southernmost on the Mediterranean coast of Spain. In 2017, more than 89,000 euros were raised through the Women’s Bank Walk. Included in this was Finnwalk, which saw Jaana Villanen, a business woman, walk 1,500 kilometres from Nuorgam, Finland’s northernmost town, to Hanko at the southernmost tip of Finland. FinnWalk raised 18,000 euros, which translates to some 600 professions for women in the developing world. It was also the largest amount ever raised for Women’s Bank through a campaign by a single individual. Women’s Bank Walk has been organised for eight years, and during its history has raised an amazing 410,000 euros for women in developing countries, a true testament to the power of volunteer activity! Finland’s largest charity golf tour, Women’s Bank Open, a tour of 26 Golf Clubs, raised over 33,000 euros for village banks and women’s education in Myanmar. The tour concluded in a final between the winners of individual competitions at Kytäjä Golf in Hyvinkää. The Women’s Bank Open tour was played for the sixth time in 2017. Over the six years, the golf tour has raised a total of 100,000 euros in support of women in the developing world. The 2017 Women’s Bank Read book tour raised nearly 10,000 euros in funds to produce 330 professions for women. 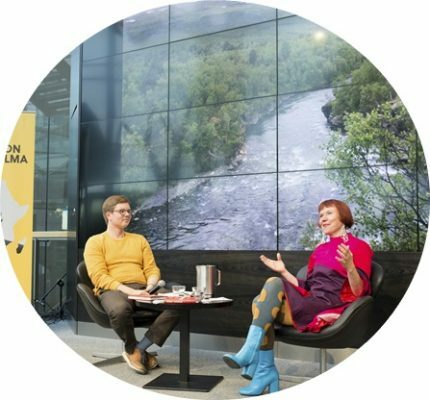 The tour featured the author Rosa Liksom with her latest book Everstinna and was organised in collaboration with the publisher Like and Suomalainen Kirjakauppa. 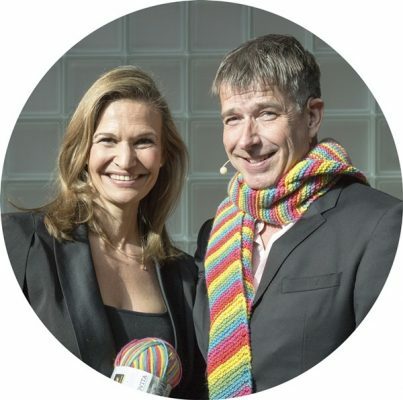 Women’s Bank Read tour had events in Helsinki, Tampere, Turku, Kuopio, Jyväskylä, Joensuu, Oulu and Rovaniemi. Women’s Bank’s ten years of operation was celebrated in Helsinki on 11 May. The event was sold out with 300 Women’s Bank supporters, volunteers and partners gathering at the headquarters of the Nordea bank in Helsinki for the festivities. Many of the influential women who founded Women’s Bank in May 2007 were present to mark the occasion. Former minister and noted human rights activist Elisabeth Rehn, who was influential in the forming of Women’s Bank, attended as an honorary guest. Africa’s first female president and Nobel Peace Prize laureate Ellen Johnson Sirleaf, President of Liberia, also sent greetings by video. It was a meeting between Sirleaf and the founding members of Women’s Bank 10 years ago that led to the birth of the organisation. 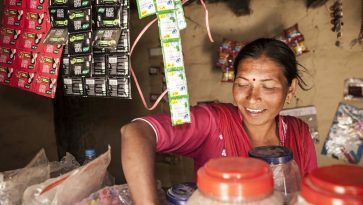 The anniversary year’s Dream campaign highlighted stories by Women’s Bank founding members, volunteers and beneficiaries from the organisation’s ten year history. 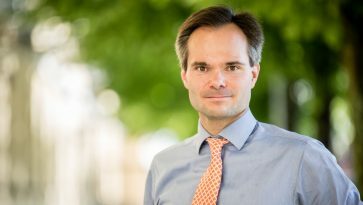 The campaign raised 10,000 euros in funds. 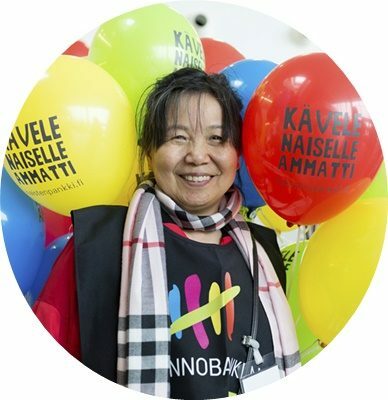 Women’s Bank’s annual volunteer training events were held in January and October in Helsinki. The day-long events were used to update volunteers on Women’s Bank’s latests news, recent field experiences and learn new things about project and volunteer work. The January event was coupled with a free dinner party in honour of volunteers. A total of 170volunteers from around the country took part in the training events. 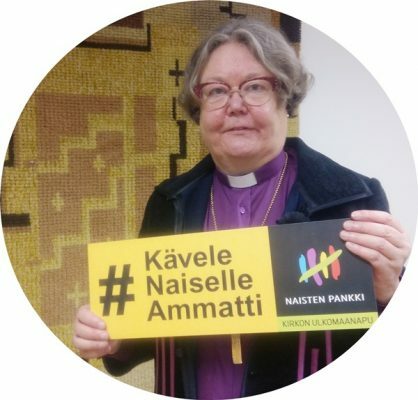 The Bishop of Helsinki Irja Askola organised a fundraiser to mark her retirement in 2017 and donated the proceedings (4,500 euros) to Women’s Bank. “Women’s Bank is engaged in quality development work and thus made for a natural choice for this special donation”, Askola said. Bishop Askola was also the recipient of the Minna Canth Award (5,000 euros), which she also donated to Women’s Bank. The donation was directed particularly towards school scholarships for girls in developing countries. Our most important individual donors were Novita Ltd and Suominen Plc. 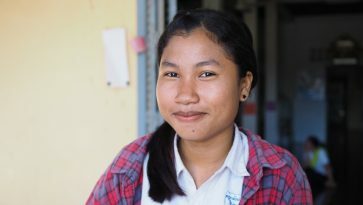 Suominen made a significant donation to Women’s Bank in early 2017, which was directed at a Women’s Bank cooperative project in Cambodia. 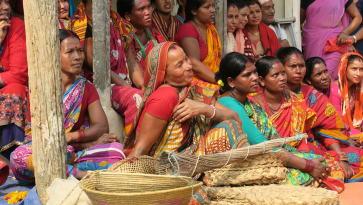 Funds from Novita’s Women’s Bank yarn campaign were directed at vocational education for women in Nepal. Women’s Bank Walk sponsors: BDO Ltd, HOK-Elanto, Power Oil, Samuji, St1, Viking Line and Wallac Ltd PerkinElmer. Individual events were also supported by numerous local sponsors. Women’s Bank Golf main sponsors: Mercedes-Benz and Golfresepti Travel. Other sponsors: Fazer, Finnair, Golfpiste, Fennia, GoGolf, Helsinki Expo and Convention Centre, Finnish Golf Association, Sixt Car Rental and Viking Line. Proceedings from the tour were directed at women’s entrepreneurship in Myanmar. Online store and event partners: EY, Fair.fi, Ivana Helsinki, Nordea, Piironki Ltd, TAIKA Jewellery and The Caviar Club. Product and service partners: Legistum Attorneys Ltd, Erweko Ltd, Karto, Kehvola Design, MBakery, Mediateko Ltd, PunaMusta Ltd, Saintex Ltd and Sokos Hotel Presidentti.